The Stamp Review Crew Brings Painted Harvest Stamp Set by Stampin’ Up! Welcome! It’s the 3rd Monday of the month so that means it’s time for a Stamp Review Crew Blog Hop! We are a group of Stampin’ Up! demonstrators who want to show you how much you can do with one stamp set. We will feature one stamp set with each blog hop, and each stop on the hop will show you a different idea using that set! This hop we bring you one of my all-time favorites: Painted Harvest! I have used this set so much already, I just cannot get enough of it. I was excited to be able to play with it more and I hope you like what I came up with! I wanted a soft feel this go-round so I decided to use Old Olive with Crushed Curry for my sunflower petals. I really like the way those two colors look together. I still like the dark center created when using Early Espresso Classic Ink. The greens (leaves and ferns) were two-step stamped with Old Olive Classic Ink, all using 1st Generation stamping (full force ink, not stamped off). I stamped all images on the white piece of DSP from the Wood Textures Designer Series Paper Stack. The sunflowers and ferns were fussy cut with my trusty Paper Snips, but the leaves were quickly cropped with the coordinating Leaf Punch. My card base is Crumb Cake Cardstock, cut to 5 1/2 in wide by 11 in long and scored/folded at 5 1/2 in to create a square card. The 2nd layer is Early Espresso Cardstock cut 1/8 in smaller to 5 3/8 in square. It was adhered to the Crumb Cake Base with Stampin’ Dimensionals. The next layer is the lighter piece of Wood Texture DSP, again cut 1/8 in smaller, to a 5 1/4 inch square. It is adhered to the Early Espresso Cardstock with Fast Fuse Adhesive. I took another piece of the White Wood Textures DSP, marked a spot near the middle but offset to one side. Then took my Stampin’ Trimmer and cut at an angle from each side to my marked spot, creating an offset triangle. I then cut the tips of the sides to create the needed width of 5 1/4 inch. I wrapped Linen Thread around the end 4 times and then secured it with a bow. I adhered it to the card with Stampin’ Dimensionals. I stamped the sentiment on the White Wood Textures DSP with Early Espresso Ink. I snipped it closey with my Paper Snips. Images were adhered with Fast Fuse or Stampin’ Dimensionals, alternating to give it dimension. The Sentiment was adhered last with Stampin’ Dimensionals. Save 10% by purchasing the Painted Harvest Bundle, over purchasing the Painted Harvest Stamp Set and Leaf Punch Individually! I kind of got away from making coordinating envelopes to go with my cards. Since this is a square 5.5 in x 5.5 in card, I decided to create an envelope to go with it since they are not something available from the Stampin’ Up! catalog. The Envelope Punch Board helps you create any size envelope in a snap! I used coordinating Crumb Cake Cardstock (use Fast Fuse or Tear Tape Adhesive to ensure it holds together) to create my envelope, stamped and snipped another matching sunflower, added a few ferns and leaves as well as more linen thread to complete the coordinating look. I sincerely hope I have inspired you today! 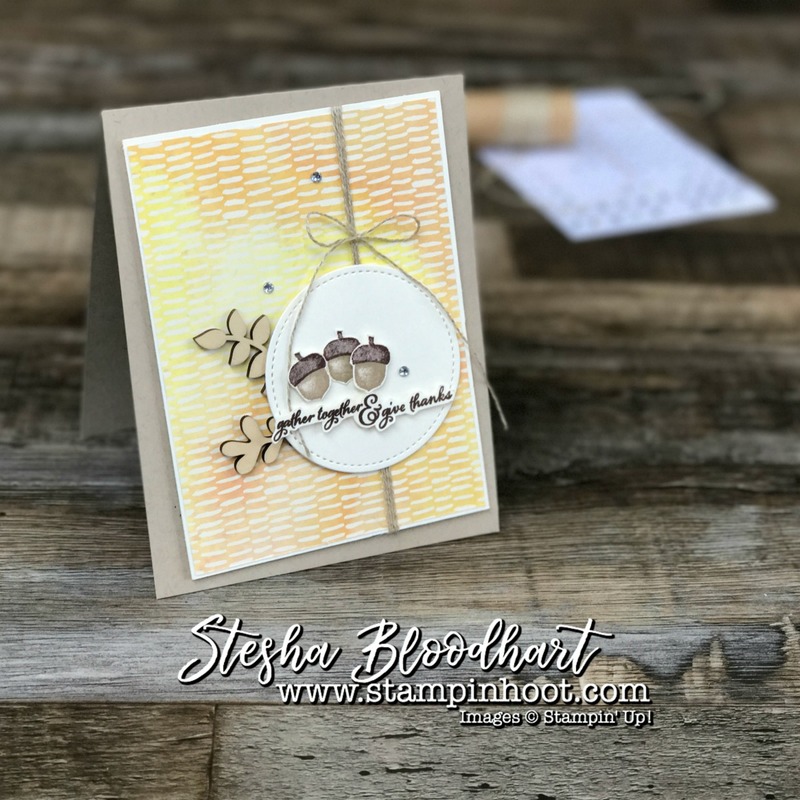 Now hop along for more inspiration using the Painted Harvest Stamp Set! If you are starting with me, you can hop back to the talented Tanya Boser @ Tinkerin In Ink or hop along to Debra Burgin @ Heartfelt Inkspiration. Want to see the entire Stamp Review Crew Line-Up in one place? Click the image below to view the Stamp Review Crew Blog! So beautiful, Stesha! The colors you chose for your flowers are just lovely. The green color palette is awesome. Would have never have thought to use those colors, but they’re really perfect. Stesha, this is a beautiful card! And I appreciate the complete directions you have for creating it. Not to mention you have included all your other cards made with the Painted Harvest set. Thank you! Stunning! You always impress. The yellow peeking through the green petals really adds such nice impact. I really love how your layout mimics an envelope with a lot of great details. So fun! Gorgeous. Love this colour combo. Thanks for including the compilation of your creations with PH. So many lovelies to look at! Beautiful, Stesha! I love the soft colors. The card layout is awesome. Wow! What a compilation of beautiful cards with Painted Harvest. Really a soft rustic feel, and the layout is fantastic!